Tide 38 Clothing: 15% off! Yes, you read that correctly! I am just over a month into Couch to 5k. I had done the program before back in college but then with my move, hurting my foot, long work hours, etc etc I stopped. I started back up again and I am loving it! I am a big believer in C25K-basically you just do interval training: walk then jog, walk then jog, adding more jogging and less walking each week. By the end of week 8/9 you are basically running for a full 20-30 minutes! You can print out the schedule for free or download the app to your phone/ipod. I have been "running" in these Hana 2 in 1 shorts from Athleta. I hate when shorts ride up (ugh) and I'm always too hot in capris/pants. These awesome shorts have an inner short (spandex/bike short material) that stays in place!! They also have a ZIP pocket for your keys. I hate that many workout bottoms don't have a zipper on the pocket. I don't want to risk my key falling out! The bigger sizes frequently sell out BUT they do restock and add new colors so check the website often! 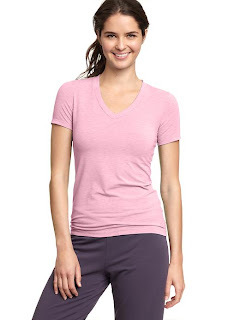 My favorite shirt is the GapFit Breathe V-neck T. It is SUPER SOFT but also breathable. You could definitely wear this as a regular shirt and no one would know it's technically a workout shirt. I had a Lululemon giftcard so I bought two of these Swiftly Tech shirts. If you want to splurge these are great! Gap has a great equivalent to the Lululemon shirt above. I have the color below and I will definitely get more! I would love to hear your running gear recommendations!!! Do you have a favorite pair of shirts or go to top? You've inspired me!!! I've always wanted to be a runner but never thought I could do it - maybe this will help. Did you purchase the $19.99 tracking program or do you just follow the schedule. Just wondering if it's worth spending $20. @Mony-I did not buy the tracking program. I just follow the schedule. When I did the program years ago I just printed out the schedule and wrote it on my hand before each run (ha). This time I decided to "splurge" and get the app for my ipod (I think it is $1.99?). A friend of mine is doing Ease into 5K with @bluefinapps running app-it's free and basically the same thing. Good luck! I really was in awful shape and am NOT athletic AT ALL but these schedules are very easy and gradual! I'm taking my 2 little monkey kids on one last trip before school starts, and then I think I will start this as soon as I get home. By the way...LOVE your blog and read it all the time. I don't usually comment, but I'm out there reading just the same :-) Thanks for such awesome posts!!! 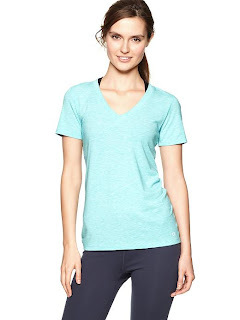 I love Lululemon for a good splurge but I've found the Old Navy workout stuff is great quality for the price! I'm a diehard Lulu girl. Love it all!